Here we go! 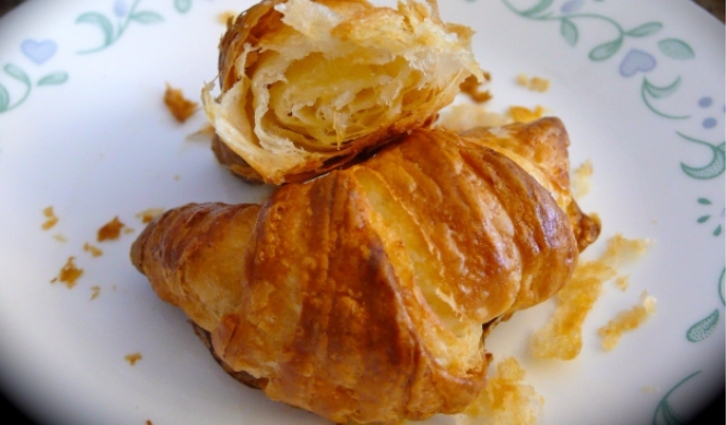 As mentioned in our post on Sunday (click here), Prudence Lau shows us step by step how to make delicious, flaky croissants! Here are few thoughts from Prudence before you get started…. These croissants were absolutely decadent, and to ‘die for’. I know one thing for sure, we will not be buying any croissants from a store ever again. Be sure to use cultured, unsalted butter and NOT churned butter, which makes the croissants too heavy in butter flavor (churned is better for cakes and cookies). Cultured, unsalted butter makes the croissants tender, flaky, and crunchy with the perfect buttery flavor. Remember you must work quickly when handling the double turned dough being sure it is cold! cold! cold!, and do not over work it. The best thing about this recipe is that you can make the croissants within a day or two. Most other croissants recipes take about 3-5 days to make – most of it is letting the dough sit for longer periods of time in the fridge and numerous double turns….honestly, in my own opinion, it’s not worth it. You’ll eat up the croissant in 40 seconds, after 3-5 days of work?! Plus if you over double turn, creating more than 1500 layers to your croissants, the recipe will flop! For more distinct layers, better flake, and by the way, less work, just do the precise number of turn indicated in the recipe. Trevor thinks that the more double turns, the more layers the croissant will have. But sometimes more is not merrier! It actually flattens the croissants! It all depends on how long you leave the dough in the fridge after the double turns. I usually leave mine in the fridge overnight. The next morning, I roll out the croissants, shape them, let them rise for 2 hours, and bake them. They are a delight to have for breakfast or brunch. 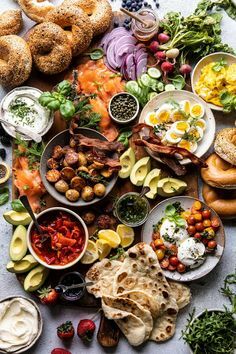 In France, they are the essence of the French breakfast. Please comment here if you get brave enough (you can do it!) and you try out this tutorial and let us know how your croissants turn out! For croissants: Place the yeast, sugar and milk in a bowl. Mix well and let if proof for about 5 to 10 minutes at room temperature. 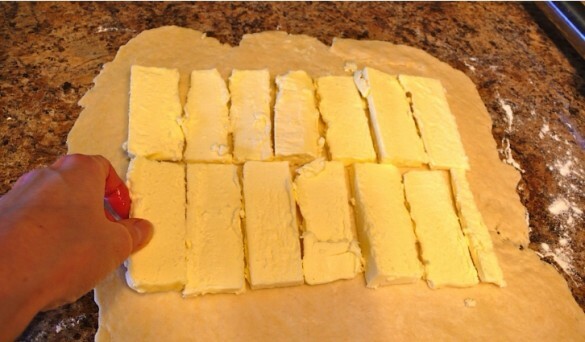 Meanwhile, cut 1 1/4 cups (283 grams) of butter into lengthwise slices. Place on plate and refrigerate. Place the flour with the remaining 1/4 cup (57 grams) of butter, salt, and yeast-milk mixture in the bowl of an electric mixer and mix on low speed using the flat beater for about 10 seconds, until it forms a ball. 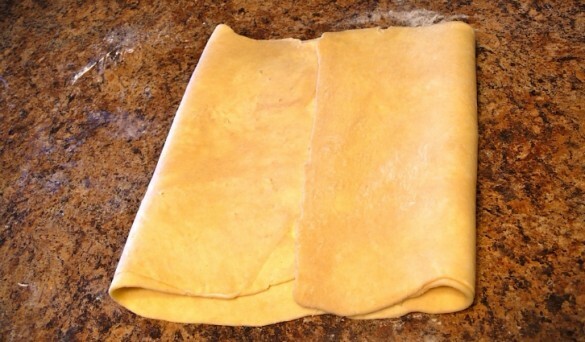 Place on floured board/surface and roll the dough into a rectangle approximately 20 inches (51 centimetres) long by 12 inches (30 centimetres) wide. 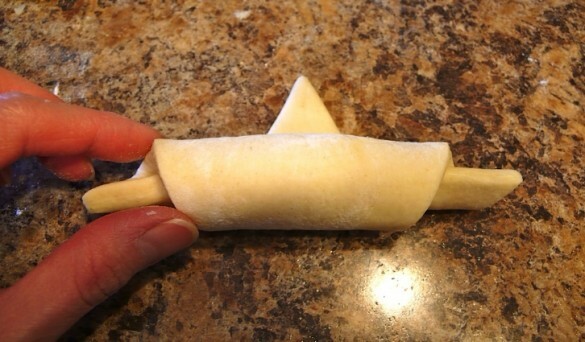 Use the extra flour to help in the rolling. Arrange the slices of butter, one next to another, on top two-thirds of the pastry, covering it to within about 1 inch (2.5 centimetres) from the edge. Lift the unbuttered third and fold on the buttered spot. Fold the remaining third over and press all around the edges. On a floured board/surface roll the dough into a 24- by 12-inch (61- by 30-centimetre) rectangle and fold it so that the sides meet in the centre. 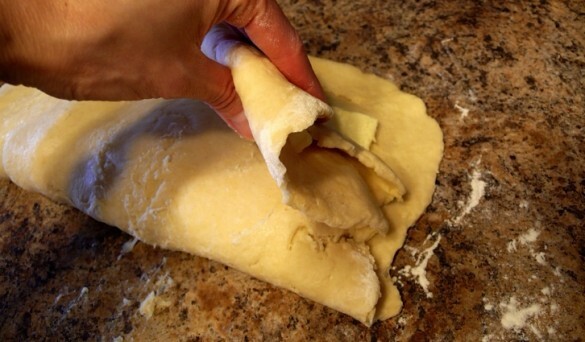 Fold the dough again to create a four-layered piece of dough. (This is called a double turn). 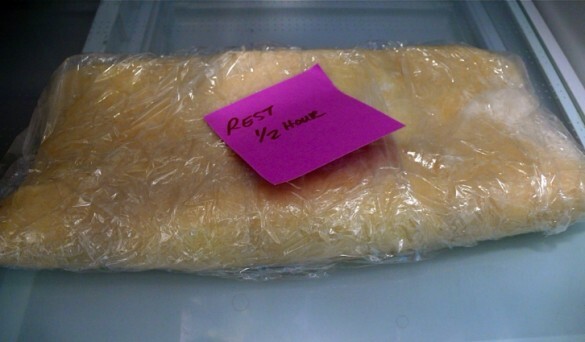 Let rest refrigerated for at least 30 minutes. 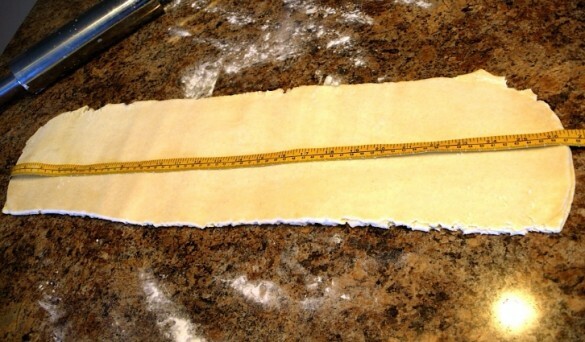 Then roll the dough into 24- by 12-inch (61- by 30- centimetre) rectangle once again and give it another double turn. Refrigerate for another 2 hours, at which point the dough can be rolled into croissants or left refrigerated overnight. After a few hours (or overnight) in the refrigerator, the dough will have risen. Flatten the dough with the palm of your hand. Roll it, into a rectangle approximately 12 inches (30 centimetres) wide by 25 inches (63 centimetres) long. Cut the rectangle in half lengthwise to make 2 strips, approximately 6 inches (15 centimetres) wide by 25 inches (63 centimetres) long. Cut into triangles about 5 inches (13 centimetres) at the base. 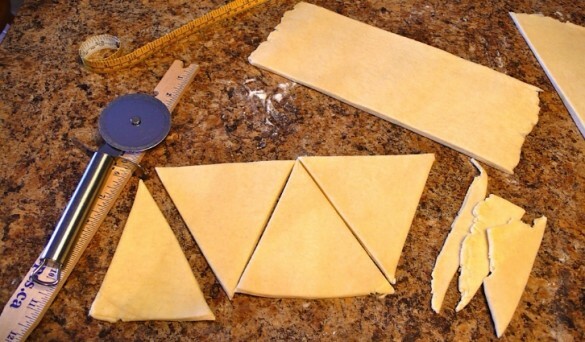 For the small croissants, each triangle will weigh about 2 ounces (57 grams). 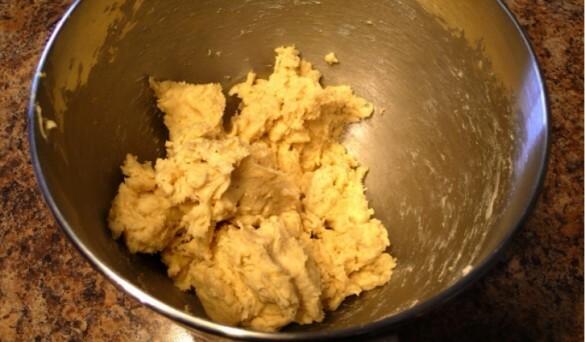 If the dough gets rubbery at any time, just let it rest again in the refrigerator. Remember that cold temperature and time are allies. Starting at the base of the triangle, use both hands to roll the dough, spreading it out as you roll forward to extend the croissant. Wet the apex of the triangle with water. Keep rolling the dough on itself until you reach the apex where the dough will stick. 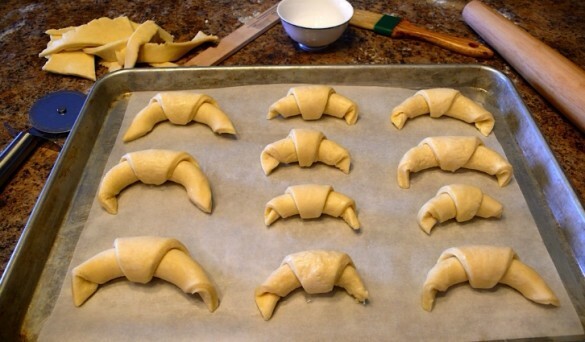 Line a cookie sheet with parchment paper and arrange the croissants, bent into a crescent shape or straight, on top. Notice that the points of the croissants are tucked under. 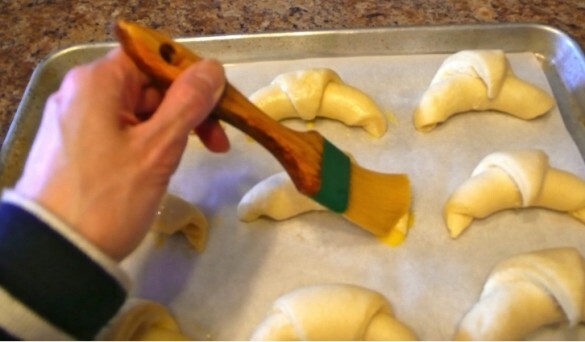 Brush the croissants with water to eliminate any flour left on top and to prevent them from drying out. Insert the tray of croissants into the oven. Let them rise in a warm place at a temperature of 70-75 degrees (20-25C) for about 1 1/2 - 2 hours (or less, depending on humidity), until the croissants almost double in size. Take croissants out of the the oven, and gently cover with a tea towel on top. Preheat the oven to 425 degrees (218 C). Brush with an egg wash (Prudence added this). 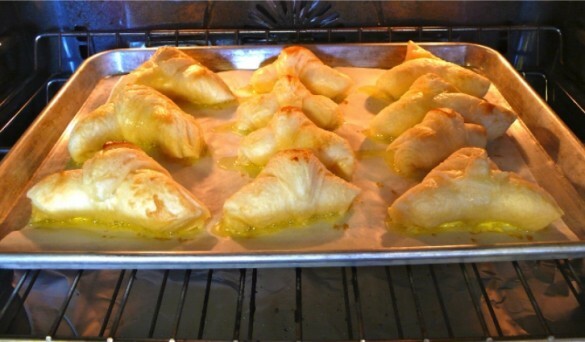 Place in the oven for approximately 15 to 18 minutes. Freeze the remaining unbaked croissants for later or repeat the rising and cooking procedures. Enjoy fresh right out of the oven. Once cooled, these can be kept in an airtight container for up to 3 days.